Newbie Isle, also known as "Uthgaard", is the zone where all new characters begin play. No matter what prestige class you choose, your character will always feel like one of these four. To learn more about the specific differences between prestige classes, see the Character Creation article's section on this. Before enter the world, you will be prompted to join a Hamlet faction which will serve as your Guild until you leave the island. If you leave this guild before reaching max level you will be teleported away from the island and be unable to return. Take caution when using this option. New characters will begin at level 10 with 10,000 starting gold in their inventories to train and buy provisions. Your first step is to promote to your chosen prestige class by visiting the appropriate trainer. It is highly recommended that you save 2,000 gold to purchase a Greater Concoction Potion from your faction's local alchemist. Each faction Hamlet has a Forge with Armor and Weapon smiths who will equip you at no cost. Replace your starting items with this gear once you have completed your training. Newbie Isle consists of two warring factions, which are selected by the player when first entering the world. If you plan on playing with friends, be sure to select the same faction! Within the center of Uthgaard is Grimstaark Peaks, where players may capture Outposts to gain buffs for their Faction, unlock access to higher tier gear vendors, various R2 class trainers and teleportation to the Outposts themselves from their Hamlet. 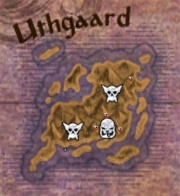 There are four Outposts in total, and victory on Uthgaard is achieved when one faction captures all Outposts. When this occurs, all characters playing within that faction are granted a chunk of experience. The island is 'reset', all players are returned to their Hamlets and the Outposts become errant once again. The losing faction will receive an "underdog bonus" buff to help them in the next round. Players cannot kill each other in the starting zones, but can participate in PvP in the central zone (Grimstaark Peaks). Players are automatically teleported away from Uthgaard at level 35. At this point, the player should seek allies for zones around that level, or risk leveling solo. This page was last modified on 28 February 2019, at 18:10.